A MIDI clip in Live contains notes and controller data for playing a MIDI instrument. This instrument can be a virtual instrument in a MIDI track’s device chain (see Chapter 17) or an external synth fed via the track’s output routing (see Chapter 14). The MIDI clip (see 4.7) provides the device with a musical score to play, specifying note pitch, length, position and dynamics (referred to as velocity in the MIDI lexicon). MIDI is composed and edited in Live’s MIDI Editor. or, in the Arrangement View, by selecting a timespan in a MIDI track and choosing the Create menu’s Insert MIDI Clip(s) command. To bring up the MIDI Editor, double-click a MIDI clip to open the Clip View. You can use the Clip View Box selector to make sure the Notes box (see 8.3) is showing, then click in the title bar of the Notes box to bring up the MIDI Editor on the right-hand side of the screen. The MIDI Editor is divided into two editing windows: the upper Note Editor and the lower Velocity Editor. You can resize the Velocity Editor by dragging on the split line that runs between it and the Note Editor. You can also show and hide the Velocity Editor using the triangular button on the left-hand side of the split line. The Control Bar’s Draw Mode Switch. Switch to Draw Mode by activating the Control Bar’s Draw Mode switch or by pressing the B key. You can now draw MIDI notes into the Note Editor with the mouse. Deactivating Draw Mode allows notes to be selected and moved around via clipboard operations or by clicking and dragging, either vertically to change their transposition, or horizontally to change their position in time. MIDI notes can also be added and deleted by double-clicking when Draw Mode is inactive. Provided your MIDI track’s device chain contains an instrument (see Chapter 17), activating the Preview switch in the MIDI Editor allows you to hear notes as you select and move them. If the MIDI track is armed, activating Preview also allows you to step record (see 16.3.4) new notes into the clip. Note that the Preview switch’s on/off state applies to all MIDI tracks in the Live Set. After drawing a few notes and moving them around, you will probably want to know how to get around in the Note Editor. So, before we get into detailed editing information, we will first explain MIDI Editor navigation. Note Scale Position Is Shown Vertically and Beat-Time Horizontally. The MIDI Editor has both vertical and horizontal navigation. Along the horizontal axis lies a time ruler, which shows note position along a musical timeline. The vertical axis contains the note ruler, displaying octaves C-2–C8, and a representation of a piano keyboard (the piano roll). Note that if the Preview switch at the top of the piano roll is activated, you can listen to the results of your piano roll playing. To smoothly change the time-zoom level, click and drag vertically in the time ruler. Drag horizontally in the time ruler to scroll from left to right. Click and drag vertically in the note ruler to change which octaves are shown, or drag horizontally to change the vertical zoom size of MIDI notes and the keyboard. Click and drag over one or more notes to select them, or over a portion of the editor’s background to select a range of time. Then, double-click on the note ruler or time ruler to automatically zoom in on your selection. If nothing is selected, double-clicking the note ruler will zoom in on the area from the lowest to the highest note in the clip, while double-clicking the time ruler will zoom out to show the time between the first and last note. To zoom in and out around the current selection, use the computer keyboard’s + and - keys. The Clip Overview just beneath the MIDI Editor can also be used for navigation. It always shows the complete contents of the selected MIDI clip. The black rectangular outline represents the part of the clip that is currently displayed in the Editor above. To scroll, click within the outline and drag left or right; to zoom in and out, drag up and down. Change the length of what is shown in the Editor by dragging the left or right edges of the outline in the Clip Overview. To quickly change what is shown in the Editor, click on a section that you want to examine in the Clip Overview, then drag downwards to zoom in, or scroll by dragging left and right. The Control Bar’s Follow Switch. The area displayed in the Note Editor can be set to scroll with playback using the Follow switch from the Control Bar. Follow will pause if you make an edit in the Note Editor, and will start again once you stop or restart playback, or click in the Arrangement or clip scrub area. When the Permanent Scrub Areas preference is off, you can still scrub by Shift-clicking anywhere in the scrub area or in the beat-time ruler. Learning about the loop/region controls (see 8.3.3) and associated shortcuts can also be helpful in getting around in the MIDI Editor and playing selections quickly and easily. As you work with MIDI, you may find yourself needing extra screen space. You can click and drag vertically on the window split between the Session or Arrangement View and the Clip View to enlarge the MIDI Editor. Enlarge the MIDI Editor by Dragging the Window Split Between Session and Clip Views. You can always return your MIDI clip to its previous state by using the Edit menu’s Undo command. Furthermore, if the MIDI clip being edited originated in a MIDI file on your hard drive, none of your editing will alter the original MIDI file, as Live incorporates its contents into your Live Set when importing. An important feature of the MIDI Editor is the Fold button, located in the upper left corner. Activating this button will immediately hide all rows, or key tracks, that do not contain MIDI notes in each MIDI clip. This means that the available key tracks in each clip in your Set will differ, depending on which notes exist in that clip. The Fold Button Extracts Key Tracks Containing Notes. When editing MIDI, you might find that you want to change which part of the clip you are listening to, or loop the clip in order to listen to it repeatedly. You can use the loop/region markers (see 8.2.2) for this. Use the Loop/Region Markers to Select a Specific Region of the Clip to Play. If Fold is deactivated on a track containing a Drum Rack (see 18.6), the MIDI Note Editor only shows rows with notes corresponding to a pad with devices on it. If Fold is activated, only rows containing notes are displayed. Tip: Selecting the loop brace in a MIDI clip and pressing CTRL-D(PC) / CMD-D(Mac) doubles the length of the loop brace and zooms as necessary to show the entire loop. Any notes to the right of the loop will be moved, so that they maintain their position relative to the end of the loop. Most functions in the MIDI Editor are subject to grid snapping (see 6.9). But when adjusting events with the mouse, the grid is “magnetic”; event positions can be moved freely up to the previous or next grid line and then will snap if you continue to drag. You can hold down the ALT(PC) / CMD(Mac) modifier while performing an action to bypass grid snapping. Editing in the MIDI Editor is similar to editing in the Arrangement (see 6.8). In both cases, your actions are selection-based: you select something using the mouse, then execute a menu command (e.g., Cut, Copy, Paste, Duplicate) on the selection. Clicking a note selects the note. Multiple notes can be selected in unison: “rubber-band” select more than one note with one mouse motion by clicking in empty space, then dragging to enclose the notes in the dotted line that appears. Esc deselects all selected notes. 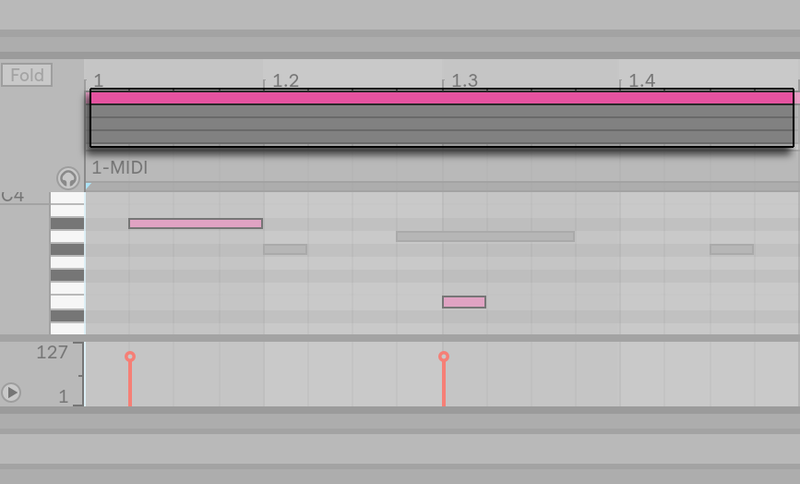 Clicking into the background of the MIDI Editor selects a point in time, represented by a flashing insert marker. Clicking and dragging in the background selects a timespan. Press Enter to toggle the selection between the timespan and any notes that begin within it. After placing the insert marker, you can manipulate it using your computer keyboard. Press the left or right arrow keys to move the insert marker to the left or right, according to the grid settings. CTRL(PC) / ALT(Mac) plus the left or right arrow keys moves the insert marker to the next note boundary. Hold down Shift while pressing the arrow keys to extend or retract the selected timespan by moving the insert marker. ALT(PC) / ALT(Mac) plus Shift while pressing the arrow keys extends or retracts from the opposite side of the selection. The insert marker can be moved to the beginning or end of a MIDI clip by pressing the Home or End key, respectively. As we have seen, notes in the MIDI Editor can be moved both horizontally (changing their position in time) and vertically (changing their transposition). They can be moved either by clicking and dragging, or with the arrow keys on your computer keyboard. Notes moved with the arrow keys are always subject to grid and offset snapping, while notes dragged with the mouse can be freely moved until reaching the previous or next grid or offset point. If you are playing the clip while you edit notes, you can listen to them play in their new assignments as you change them. To transpose selected notes by octave, hold down Shift while pressing the up or down arrow keys. Shift plus the left or right arrow keys extends or retracts the duration of selected notes, according to the grid settings. To extend or retract notes without snapping to the grid, also hold ALT(PC) / CMD(Mac). To change the selection to the next note in the same key track, hold CTRL(PC) / ALT(Mac) while pressing the left or right arrow keys. CTRL(PC) / ALT(Mac) plus the up or down arrow keys moves the selection to the next note in time. To nudge notes without snapping to the grid, hold ALT(PC) / CMD(Mac) and press the left or right arrow keys. You can use the Shift modifier to click and add individual notes or additional “rubber-band” selections to your current selection. You can also remove a single note from your selection by holding down Shift and clicking on it. Holding Shift and clicking on the piano roll adds all notes in a single key track to the current selection, or removes them if they were already selected. Selecting a note (or notes) makes it subject to commands from the Edit menu, such as Copy and Paste. Notes in the clipboard will be pasted starting at the location of the insert marker. You can also use the CTRL(PC) / ALT(Mac) modifier to click and drag copies of notes to a new location. If you click and drag to move notes but then decide that you would like to copy them instead, you can press the CTRL(PC) / ALT(Mac) modifier even after starting the drag. When editing or drawing, you may sometimes place a new note on top of one that already exists. If the new note overlaps with the beginning of the original note, the original note will vanish. If the new note overlaps with the “tail” of the original, the original note’s length will change so that it lasts just until the new note’s beginning. Clicking and dragging on a note’s left or right edges changes its length. As with note positions, note lengths can be adjusted freely up to the previous or next grid line but will be quantized when dragging further unless the ALT(PC) / CMD(Mac) modifier is held down. Tip: To set a group of notes to the same length, select them all, grab the end of the longest one, drag them all down to zero length and then extend them. The standard clipboard commands like Cut, Copy and Paste only affect the currently selected notes (or the notes within a time selection). But, as in Arrangement editing (see 6.10), there are “... Time” commands that act upon the entire MIDI clip by inserting and deleting time. Note that these operations do not change the clip start/end position or the loop brace settings. Duplicate Time places a copy of the selected timespan into the clip, along with any contained notes. 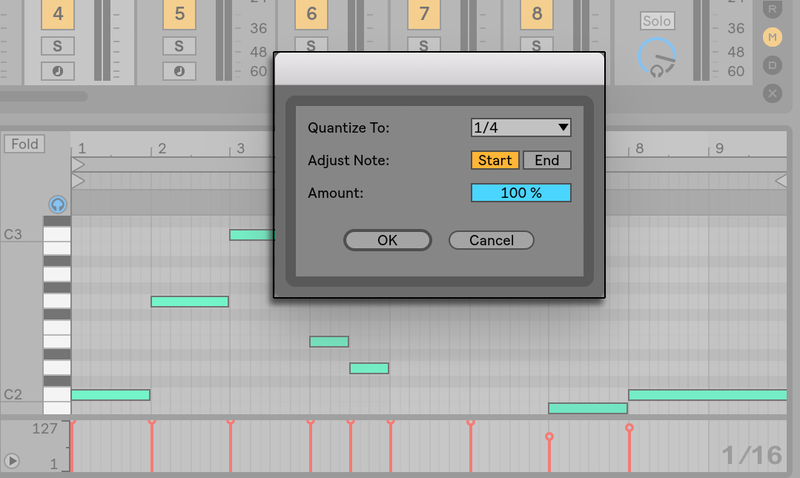 Delete Time deletes a selection of time from the MIDI clip, thereby moving any notes on either side of the deleted area closer together in the timeline. Insert Time inserts as much empty time as is currently selected into the clip, before the selection. 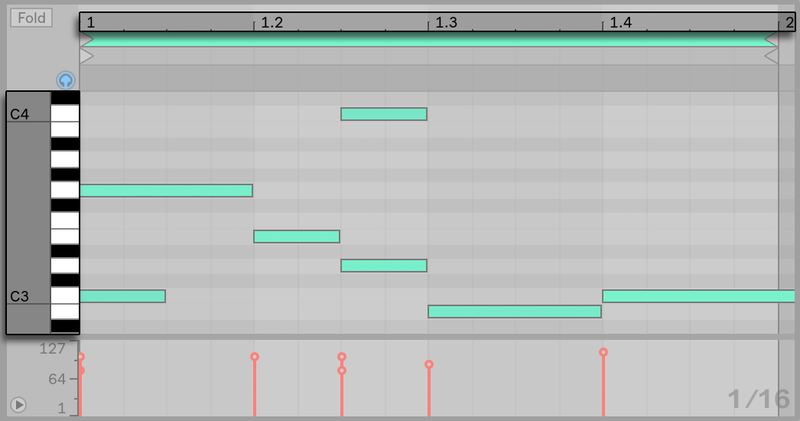 There are three options for quantizing MIDI notes in Live. First, you can quantize MIDI notes as you record them (see 16.5). Secondly, as previously mentioned, you can move notes so that they snap to the visible grid lines. Finally, you can select a note or notes and choose the Quantize command from the Edit menu, or use the CTRL-U(PC) / CMD-U(Mac) hotkey. The first time you do this, you will see a dialog box with several quantization options. This will quantize using default settings, or the settings that you previously applied. To adjust your quantization parameters, open the Quantization Settings dialog from the Edit menu. Using the options presented here, you can select either the current grid size or a specific meter value for quantization and set either the note start or end (or both) to be quantized. Quantizing the note end will stretch the note so that it ends at the chosen meter subdivision. You can also quantize notes without giving them that “quantized” feel using the Amount control, which will move notes only by a percentage of the set quantization value. To change velocity for a MIDI note, click and drag on the associated marker in the Velocity Editor. (To help you locate the velocity marker belonging to a MIDI note that may be stacked vertically with others, Live highlights the velocity marker for whichever note your mouse is hovering over.) Velocity changes will be shown numerically in a small display in the time ruler. As in the Note Editor, you can select multiple velocity markers to change by clicking with the Shift modifier held down. Tip: To set a group of notes so that they all have the same velocity, select their markers in the Velocity Editor, drag them up or down to either maximum or minimum velocity, and then adjust velocity to the desired value. As we saw earlier, Draw Mode allows drawing identical velocities for all notes within a grid tile. While in Draw Mode, velocity drawing is limited to only those notes that are currently selected. To draw markers individually (as you would want to with a crescendo, for instance) deactivate grid snapping with the CTRL-4(PC) / CMD-4(Mac) shortcut, or simply hold down the ALT(PC) / CMD(Mac) modifier. Drawing Identical Velocities (Left) and a Crescendo (Right). Tip: To draw a velocity ramp with notes that are all in the same key track, click a key in the piano roll to select all notes within the desired key track. Make sure Draw Mode is activated and draw the ramp into the Velocity Editor. This will affect only the selected notes. Tip #2: To draw a linear velocity ramp across a selection of notes, first select the notes that should be affected (using the Shift modifier to select non-adjacent notes if necessary). Make sure Draw Mode is not activated and draw the line into the Velocity Editor while holding the CTRL(PC) / CMD(Mac) modifier. Notes in the Note Editor display their velocity in their coloring — light notes play softly, and vice versa. 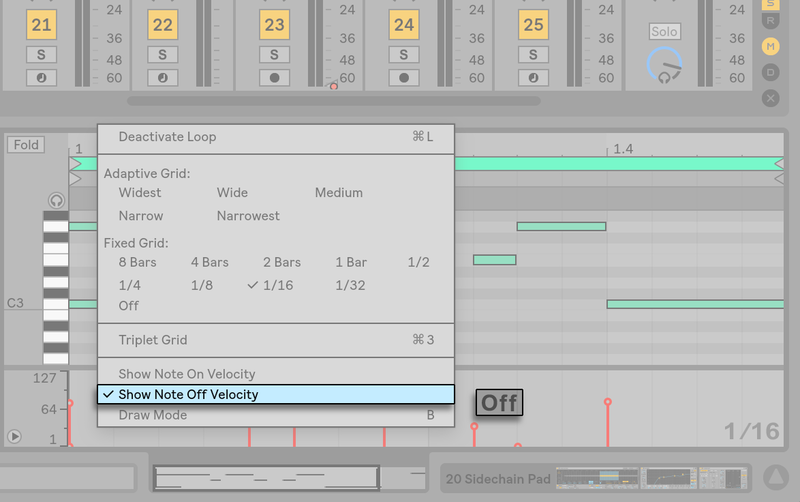 To change the velocity of notes without the Velocity Editor open, click any selected note and drag vertically while pressing the ALT(PC) / CMD(Mac) modifier. Vertical movements in Draw Mode correspond to velocity changes. This means that, with one horizontal motion and one vertical motion, you can draw multiple notes and their velocities without releasing the mouse button. If you change velocity with this vertical movement, Live will remember the change and use your new velocity on any notes that you draw afterward. By default, the Velocity Editor allows you to adjust note-on velocities. But you can toggle the editor to show note-off velocities via options in the editor’s right-click(PC) / CTRL-click(Mac) context menu. The Velocity Editor Showing Note-Off Velocities. Please note that note-off (or “release”) velocity is a somewhat esoteric parameter, and is only supported by certain devices. 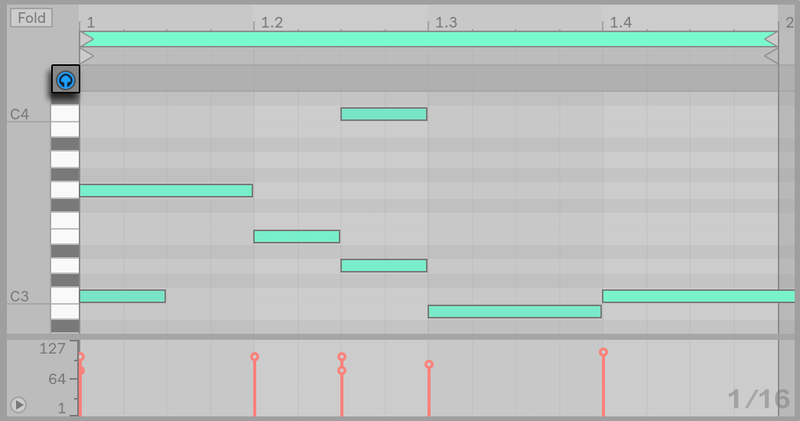 Ableton’s Sampler instrument (see 24.7), for example, provides note-off velocity as a controller for a variety of parameters. When multiple notes or a range of time are selected in the Note Editor, Note Stretch markers will appear, allowing notes to be scaled proportionally in time. The markers are a pair of downward-pointing indicators that snap to the beginning and end of the selection. By clicking and dragging one of the markers horizontally, the selected notes will move and stretch so that they continue to occupy the same proportion of time that they did when they were initially selected. As with notes, Note Stretch markers can be freely moved until reaching the previous or next grid or offset point, after which they will snap to the Note Editor’s grid lines unless the grid is not shown or the ALT(PC) / CMD(Mac) modifier is held while dragging. When the mouse is between the Note Stretch markers, a “pseudo” stretch marker will appear. Dragging this stretches or compresses the material between the fixed markers without affecting the material outside of them. The pseudo stretch marker has the same grid snapping behavior as fixed markers. When notes (but not time) are selected, one marker can be dragged beyond the boundary of the other, which will “reflect” the order of the stretched notes in relation to their initial sequence; this is sometimes referred to as “retrograde” behavior. Adjusting the Note Stretch markers will also adjust the timing of any of the clip’s linked clip envelopes. Unlinked clip envelopes are not affected. MIDI data that is outside of the loop brace can be deleted by means of the Crop Clip command. Simply right-click(PC) / CTRL-click(Mac) on a MIDI clip in the Session or Arrangement View and select this option. Unlike cropping audio clips (see 8.2.10), cropping a MIDI clip does not create a new file on disk. To deactivate, or mute, a note (or notes) in the MIDI Editor, select it and press 0. The Deactivate Note(s) command will mute the note, making it appear gray in the display. Press 0 again to reactivate notes. You can de- or reactivate all of the notes in a single key track at once by clicking a key on the piano roll and pressing 0. In addition to the editing possibilities within the MIDI Editor itself, the Notes Box’s transform tools (see 8.3.1) offer a number of ways to quickly manipulate the notes within a MIDI clip. In the Note Editor, you can view notes in multiple MIDI clips at the same time. This helps you to see melodic and rhythmic relationships between different clips when creating and refining musical ideas, and allows you to edit material across separate tracks and scenes more quickly. The notes from these clips will be shown together in the Note Editor. Only one clip will be active for editing at a time. The active clip’s notes will be shown in that clip’s color, while the inactive clips’ notes will be shown in gray. Loop bars will appear above the Note Editor. Each loop bar represents a different clip in the current selection. The active clip’s loop bar will be shown in the clip’s color, while the inactive ones will be shown in grey. Multi-Clip Loop Bars in the Note Editor. Hovering the mouse over an inactive clip’s notes or loop bar will reveal that clip’s color, helping you to choose a different clip in the current selection to edit. Clicking on a clip’s note or loop bar switches to that clip for editing. You can edit the clips using the Clip Name, Clip Color and Clip Time Signature commands in the Clip box (see 8.1). Note: Folding (see 10.4.2) the Note Editor is not possible when editing multiple clips. Multi-clip editing works differently depending on whether you are working in the Session or Arrangement View. These differences are explained in more detail below. 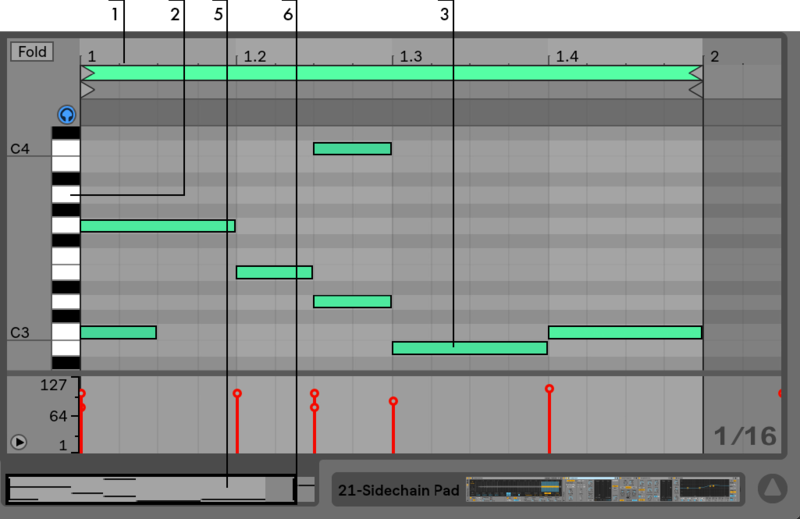 In the Session View, you can select and view up to eight looped MIDI clips at the same time. In the Note Editor, loop bars are ordered vertically (first by track, and then by scene). If multiple clips of different lengths are selected, the Note Editor will show as many loop iterations as necessary for the clips to realign. Loop points are represented by black vertical lines in the Note Editor. Clips with a start marker set before the loop start are represented by a bar at the top of the Note Editor. While multi-clip editing is useful for looking at clips across different tracks, it can also come in handy when you need to compare and edit multiple clips within the same track. For example, you can create evolving pattern progressions by adding notes to a clip, then making a variation to the clip in the following scene and so on, while maintaining an overview of the other clips in the track. In the Arrangement View, it is possible to select and view MIDI clips from up to eight tracks, across a selection of time. 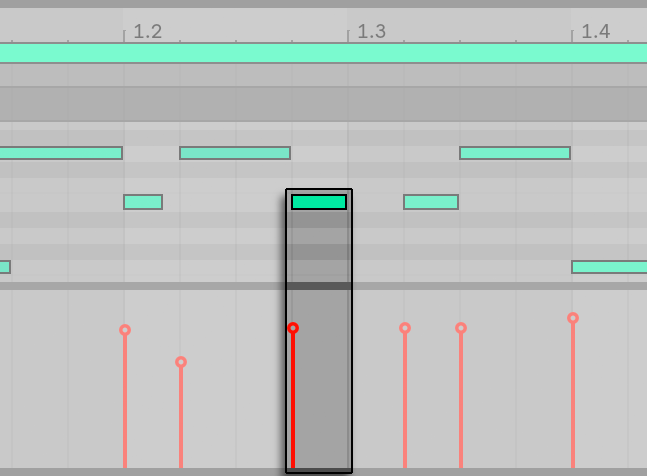 In the Note Editor, loop bars are ordered vertically by track and horizontally by time. The Note Editor will not show silence before or after the selection of clips – instead, it will fit its display range to show the beginning of the first clip up to the end of the last clip in the selection. If the selection contains looped and unlooped clips, the Loop button will appear half colored.